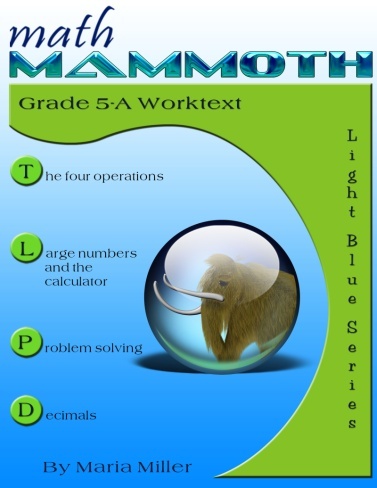 Math Mammoth Grade 5 Complete curriculum - description, samples, and purchase info. Math Mammoth Grade 5 Complete Curriculum is a complete math program for 5th grade, providing you with everything you need to teach 5th grade math. It is available both as a download version and as printed copies. 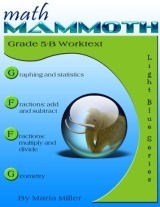 You can purchase Math Mammoth Grade 5 as a download, on a CD, or as already printed books. You can purchase a lesson plan for Math Mammoth Grade 5 to use it in Homeschool Planet online planner. Learn more. Please also see the table of contents 5-A and 5-B (in the sample files), which will let you see the topics covered in more detail. For $9.95, you can purchase a lesson plan for Math Mammoth Grade 5 in order to use it in Homeschool Planet online planner. Learn more. The year starts out with a study of whole numbers and their operations. Students get to review multi-digit multiplication and learn long division with two-digit divisors. We also review divisibility and factors from fourth grade, and study prime factorization. In the second chapter, the focus is on large numbers and using a calculator. This is the first time a calculator is introduced in Math Mammoth complete curriculum—thus far, all calculations have been done mentally, or with paper and pencil. I want students to learn to be critical in their use of the calculator—use it with good judgment. Every exercise where calculator use is to be allowed is marked with a little calculator symbol. The fourth chapter is about decimals and their operations. It is a long chapter because now is the time to learn decimal operations well. It is assumed that the student already has a solid foundation for decimal place value, as taught in Math Mammoth 4th grade curriculum. That is the true means of preventing common misconceptions, or students resorting to rote memorization of the decimal operations. Chapter 6 is about the addition and subtraction of fractions—another focus topic for 5th grade, besides decimals. Students learn to add and subtract unlike fractions, using the technique of first converting them to equivalent like fractions. Chapter 8 takes us to geometry, starting with a review of angles and polygons. From there, students will learn to draw circles, to classify triangles and quadrilaterals, and the concept of volume in the context of right rectangular prisms (boxes). A ruler that measures in inches (for 5-B). A ruler that measures in centimeters (for 5-B). For $9.95, you can purchase a lesson plan for Math Mammoth Grade 3 in order to use it in Homeschool Planet online planner. Learn more. This is our first year homeschooling because we wanted to travel. We started doing Singapore Standard Edition because that is what she was doing at her former school. I immediately realize that despite an MBA and a pretty good math background, I had no idea what I should be doing to teach the lessons. So we stated looking for something else, challenging, but that I could understand and teach. We selected MM and also are using CTC Math because of the videos, a perfect combination. I like that MM is a printable since we do not always have internet connection on the road and they give us all the grades. Because Singapore skips some basics in the early grades, I am combining both the 4th and 5th grade MM lessons as I determine what my child needs. Excellent program, plenty of practice and the examples, unlike Singapore really make the lesson objective clear. I would highly recommend. My children (first and fifth graders) have both enjoyed Math Mammoth very much. I like that I only print what I need and they like not being bombarded with too many problems per concept. Once they get it, we move on. I love the unit studies like "Money" which I can use with both kids. Highly recommend Math Mammoth! Review: Math Mammoth (Revisited) - Introduction to Fractions, Division 2, Light Blue grade 5 by Got Chai? blog. Thank you so much Maria. We adore you! I really appreciate having access to such an exceptional program. What a God send. You are such a blessing to our family and our homeschooling community. It's the best math program we've seen. And we've tried many over the years.... Saxon, Singapore, Calvert and one in the public school system that we were able to borrow. It beats them hands down. It is thorough, well thought out and it makes our kids think math. There's just enough practice and repetition for concepts to really sink in without boring them. It's the only math program that we've used that I didn't have to run searching for a supplement. Thanks again Maria, so very glad that we found you. Note: the two reviews below refer to the older version of MM5. However, it is fundamentally similar to the new, revised version. Zayne's math studies are going great! I like this curriculum so much better than Saxon... we spend enough time on each new concept so that he really "gets it"! The downloaded material (grade 5) is much more colorful (and therefore keeps his interest!) than the printed version of Math Mammoth [used in grade 4]. And with all the extra "helps" you provide; from hints, suggestions and games to a list of other sites with games, downloads (math rider was a favorite!) and freebie helps... you've made math FUN for BOTH of us! I really can't thank you enough (and I've already homeschooled 2 boys...one is a computer website developer and the other is a chemical engineer...so I'm an OLD mom and frankly ready for some fun with schooling)! I am a mother of 2 lovely daughters ages 13 and 11, both in French immersion public school on Vancouver Island, Canada. My youngest daughter has had a difficult Grade 5 year with math and had some extra learning assistance provided at school. I have often worried that because all instruction is in French, her second language, it may ultimately be more difficult for her to understand the math lessons or perhaps the way it was taught. And although I have tried to help her during the school year, it became more of an exercise in translation, for I have only taken 1 year of basic Introductory French at University, and she had to translate the question for me before I could help. So here we are, day 4, page 17, she is picking up speed and her attitude has lifted as she begins to understand math covered so far. I really like the the lessons or rules are highlighted or outlined so it is easier to refer back to. The worksheet are visually appealling as well. I hope we can get through the whole course this summer without it being too arduous, but I see that she is gaining self esteem and excitement she works though questions with a little less guidance from me. So, Thankyou very much Maria! I expect to be purchasing the grade 6 Light Blue worktext to 'work along' with her as she returns to Math in grade 6 French immersion in September. I feel more confident that I will be able to track her progress and then offer help as necessary (or IF necessary! ).